Each month, faculty and staff are recognized for their enormous contribution to Union. 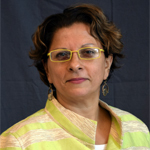 In recognition of the recently completed Summer 2018 Ph.D. Residency, this month’s faculty spotlight is on Dr. Anu Mitra who teaches in the Ph.D. in Interdisciplinary Studies Program and chairs the Admissions Committee. She presents each new student with a synopsis detailing why Union is a special academic home. Learn more about this piece and Dr. Mitra in the Q & A below. A. I am now in my 31st year at Union and I am still excited about teaching. I believe in adult higher education more than ever because the working adult takes time to process and understand and reflect on ideas that are important in shaping self and society. This long runway—beginning in higher education, taking a break for life reasons, and then returning to it—provides most adult students with a grounding in wisdom that one would not naturally come upon. Seeing minds begin to work along paths that are meaningful to one’s self is gratifying beyond measure! Union Institute students learn by taking part in collaborative inquiry—a process where each one of us learns from the wisdom and experience base of the other. This is not to say that we put aside the canon or critical works of literature in specific fields. This is to say that at Union, the learning process is democratized. Faculty members and students segue into each other’s learning landscapes to deepen one’s understanding of one’s field, of other areas of knowledge, or of the world in general. Social justice principles and values guide everything that we do at Union —every degree program has at its core the basis of a social justice awareness, and this awakening acts as a guide to all that we believe. At Union, we believe that it is not enough, perhaps, to know—it is vitally important to act on what we know. For these reasons, we are called upon to enact what we have come to believe. Leadership practices and principles are critical to how we shape our responses to the world around us and each student is encouraged to make active, meaningful contributions to the world even as they navigate the program. This, I believe, is how Union tends toward a more perfect union of practical action and theoretical ideas. A. I would be an Egyptologist or a paleontologist doing field research and soaking in different cultures of the world. A. That I am a lot funnier than I give off and act. A. I love a well-written book and a story line that hooks me in. The Russian writers—Chekov, Dosteovsky, Tolstoy—are all-time favorites as are Latin American writers such as Mario Varga Lhosa, Gabriel Garcia Marquez, Octavio Paz, and Isabelle Allende. I enjoy the recent wave of writers from the Indian diaspora—Sunil Khilnani, Suketu Mehta, Sri Lankan Anuk Arudpragasam. I seem to float through various diasporas of constructing story. Recently, I completed A Gentleman in Moscow by Amor Towles and it was compelling to the core, examining what it means to be human. All of us need to discover through story what that means and how each one of our lives amounts to something important. Dr. Mitra holds a Ph.D. from the University of Rochester, in New York. Her areas of expertise are visual culture, arts-based practices, art and leadership development. She has presented on several aspects of her work, most recently at the Art of Management and Organizations, American Management Association, International Leadership Association, among others. Dr. Mitra is a strong believer in interdisciplinarity —believing that our world is too complex and dynamic to be understood through the lens of a single discipline. Her research and workshops linking art and social justice and art and leadership development have been offered at many forums, including the J. Paul Getty Museum in Los Angeles, the University of Cincinnati Medical School, and to doctoral candidates at Union. She continues to be drawn to the idea that all problems are capable of being solved, but only if we are able to view multiple solutions through the lenses of different perspectives. She has traveled to more than 50 countries and lived on three continents. Frequenting museums, going to the movies, and reading fiction are her major obsessions. A Ph.D. is within your grasp. Choose your program today. Click below.